The exhibition will be opened on Thursday, February 4th 2010, at 7.30 pm, and can be visited until April 11th 2010. 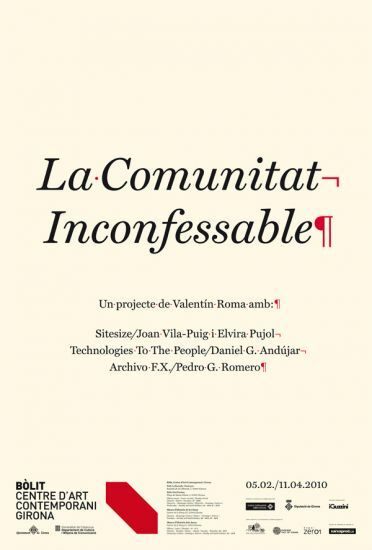 The project was conceived to be part of the first pavilion of Catalonia at the 53rd Venice Bienniale, taking its title from the book with the same name, by Maurice Blanchot. It takes up the book's philological interpretation of communism as "what creates community", and it examines the complex relations between art and community. 1. An exhibition distributed over different places of the city: the Museum of History of Jewish People, Bòlit-La Rambla, Bòlit-Sant Nicolau, Dadespai and the Museum of the History of the City. The exhibition consists in three different proposals: Sitesize, by Joan Vila-Puig and Elvira Pujol; Technologies To The People, by Daniel G.Andújar; and Archivo F.X., by Pedro G. Romero. 2. A book which deals with the nature of community, from the point of view of different authors. 3. A website which gathers the different points of view of the Social Sciences with regards to the notion of "community". 4. A series of talks, with the collaboration of the University of Girona.